the serverless school: Creating Custom Bookmark Apps for Chrome. Creating Custom Bookmark Apps for Chrome. Google G Suite makes it easy for administrators to provide web links for staff and students by publishing applications from the Chrome Web Store into the app launcher. But what happens if you want to pin a shortcut to a site that doesn't have an app in the Chrome Web Store ? The common solution is to use a bookmark, which is also the fallback option for advertising internal web resources and custom URL’s. Fortunately Google provides you with an option to do just that and although it involves a little bit of work I think the end result is worth the effort. The process involves updating a few settings in the admin console to create a private collection in the Chrome Web Store and placing the URL in an “app wrapper”. Once this is achieved the link can be managed like any other app rather than a bookmark. In this example we’ll walk through the steps required to publish this blog as an app for the fictitious MiddleTown Academy using the Google domain ma.co.uk. Creating the Private Chrome Web Store. and search for the Chrome Web Store section. You can set these options at any sub-organisation level but for a unified site you’ll probably apply the settings to the root organisation. At this stage it’s advisable to keep the Chrome Web Store Homepage to the default to avoid confusing the users. 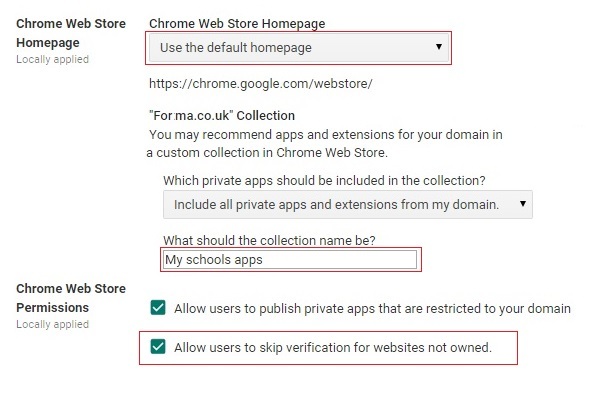 Give the collection a user friendly name and check in the two permission options. The second setting allows users to create bookmark apps pointing to websites that they do not administer. Once this is done the Chrome Web Store should show the new collection thats just waiting for your new app. A Chrome Web Store app is nothing more than a set of editable files called a manifest which can be created manually if you are fully conversant with JSON and fancy a challenge. Fortunately there is an easier way. Install the Chrome App Builder app from the webstore. Once launched the inputs are fairly self explanatory and include the URL of the site you wish to embed as well as various presentation options. As you select each option the top half of the screen gives you some idea what the resulting app will look like. Finally the Export button creates a set of files that can be found in the local Downloads area within the /Export folder. Your new app is almost ready to publish, you just need a few more graphics files and some information for the Chrome Web Store page. Sign in to the Chrome developer dashboard (above) . Add a new item and upload your app as a zip file. Since you’ll be using a Chromebook just highlight the Export folder in the right hand pane, right mouse click and select zip selection. This will create an archive called Export.zip at the same level. At this stage you’ll be presented with a dialog that has been populated with information from the app manifest. Just a few fields need updating and some of these are mandatory so don’t try skipping this bit. Detailed description - Focus on explaining what the item does and why users should install it. Icon - You’ll want to replace the default icon with something more appropriate. It needs to be a 128 X 128 pixel graphics files. I used .png for this example. Screenshots - up to five screen shots to give users some idea of the function of the app. Provide at least one at either 1,280 x 800 or 640 x 400 pixels. Promotional Tile Image - Another Chrome Store image. Only the small tile at 440 x 280 pixels is mandatory. There are plenty of other options but Visibility is only one thats important in this situation. 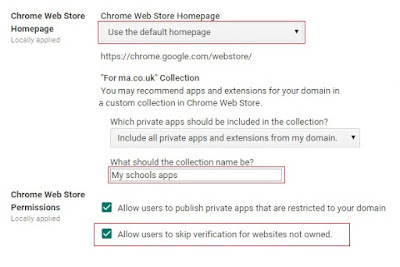 Select Unlisted to publish your app to the <your school domain> private collection. There’s nothing stopping you publishing your apps to the main Chrome Store. 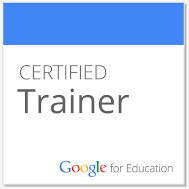 You just need to pay Google a one-off developer registration fee of $5.00 for the privilege. OK we are now good to go. Press the Publish Changes button and you should see banner to the effect that your apps has been published. At this point go and make a coffee and when you get back you should see the new app in the collection. You’ll now be able to manage the link from the console like any other app including pinning to the shelf. Have a go. It's a lot easier than it sounds.